Firstly, I apologise for not posting this last week as I said I would – one thing led to another and even though I had the recipe typed out, the photos weren’t edited and being my OCD-self there was no way I was posting photos without cropping them to the same dimensions and making a title image so the post would be the same as the others on here. 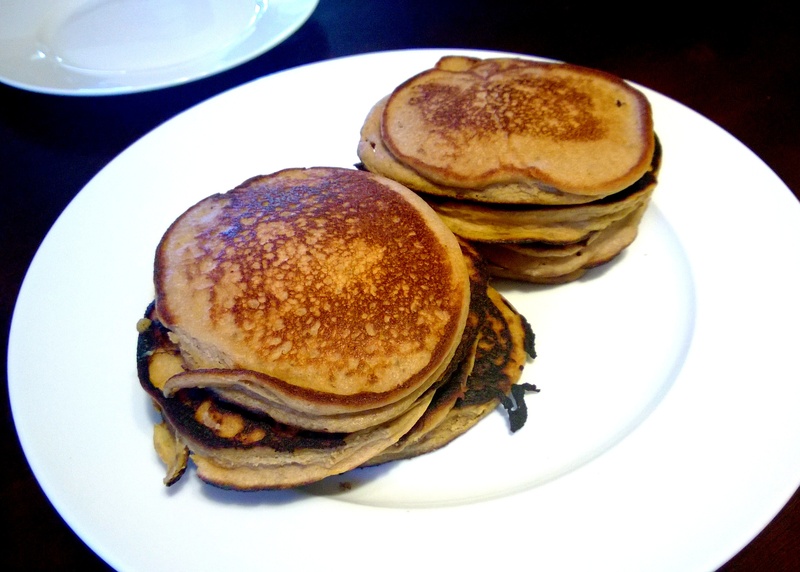 Flourless banana pancakes have been floating around Pinterest and all the low carb websites lately and this is my take on them. Many recipes I found said that, due to the lack of a binding agent, the pancakes had to be made no more than 5 cm (2 in) across or they wouldn’t flip and would turn into scrambled bananas – so I decided to add in some almond meal… still technically “flourless” (and lower in carbohydrates) but not purely egg and banana, especially considering I added some plain Greek yoghurt in there for good measure. 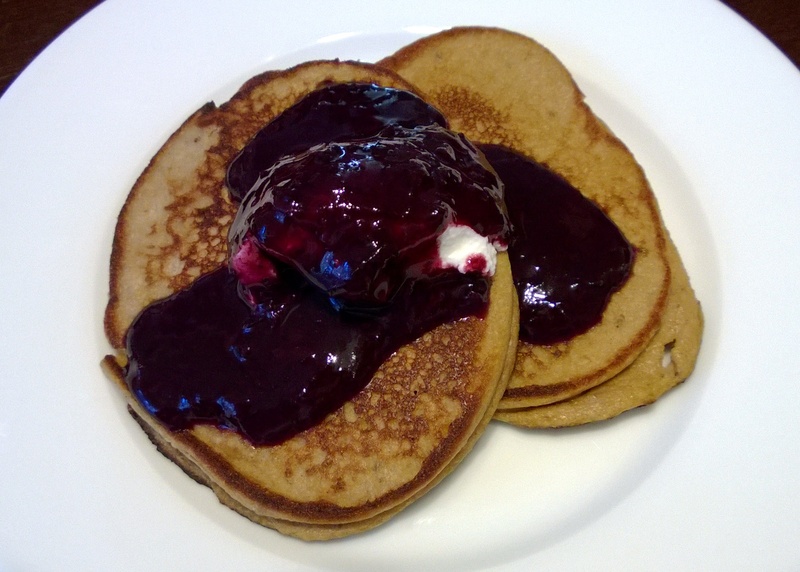 The texture isn’t the same as normal pancakes – they aren’t as fluffy and are much softer than wheat or GF pancakes – so they might not be your cup of tea but I like them. There is a subtle banana and almond flavour with a hint of the vanilla extract and the yoghurt gives them a soft creaminess. Almonds are considered low FODMAP in servings of 10, somewhere between 10 and 20 almonds they become high FODMAP – 1/4 cup of almond meal shouldn’t be more than 10 almonds, considering all the air that’s introduced to volume when it’s milled, but if you are worried then buckwheat flour is a suitable substitute for some or all of the almond meal. If you malabsorb lactose, make sure you use lactose free yoghurt. One banana to one egg might seem like a lot but the protein in egg whites is both good for us and helps to bind the mixture. I am also of the school that egg yolks are not evil. Yes, I know, they are only about 10-15 cm across so I technically I should have called them “pikelets” but I have already made the title image and I am not doing it again. 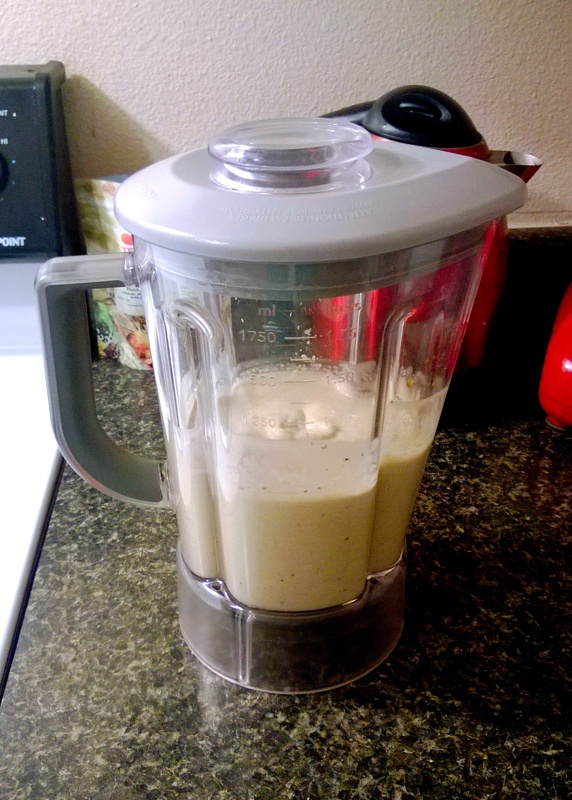 Place the wet ingredients in your blender or food processor – I like a blender because it makes pouring the batter a breeze – and whiz until smooth and combined. Then add in the dry ingredients and blend on a medium speed until they are fully incorporated. The batter is done. If you feel it needs to thicken up a little, let it sit for 5 minutes and the chia seeds will go to work. Seal your pan and reduce it to no more than a medium heat, as these brown very easily. 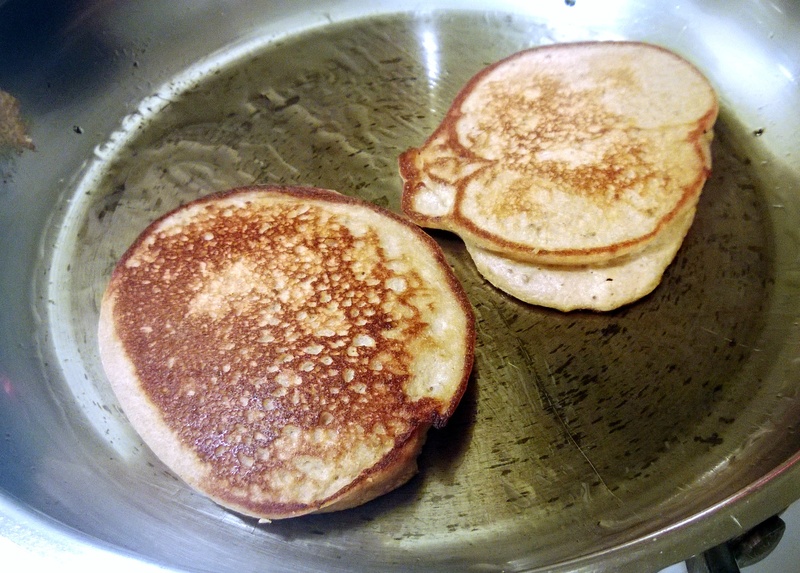 Pour the batter into little blobs (approximately 1/2 cup in each but I don’t measure) and set the timer for 3 minutes. 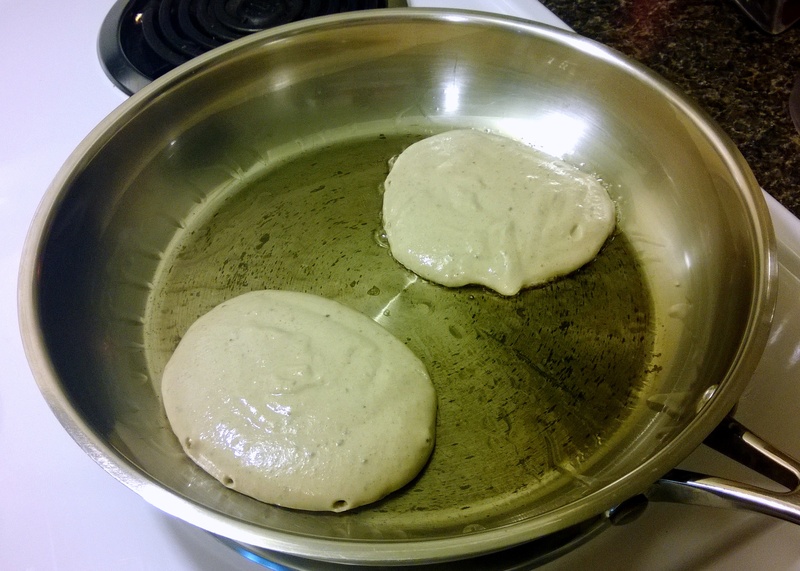 Bubbles should start to appear by this stage, and if the pancake slides around freely on the sealed pan surface then it is ready to flip. Don’t fiddle with the pancake, trying to loosen or move it, until it has formed a skin and is sturdy enough to move or you will just damage it. Once flipped, cook for another 3 minutes on the other side and place on a plate in the oven (on the warming setting) to keep them hot until they are ready to be eaten. The “3 minutes a side” rule is also just a guideline, depending on how hot your stove is, how well your pan transfers heat etc. Serve with a yoghurt of your choice and a fruit compote – I made a blueberry compote that I had preserved but any of my jam recipes would work as well, or your favourite store bought jam – or pure maple syrup. 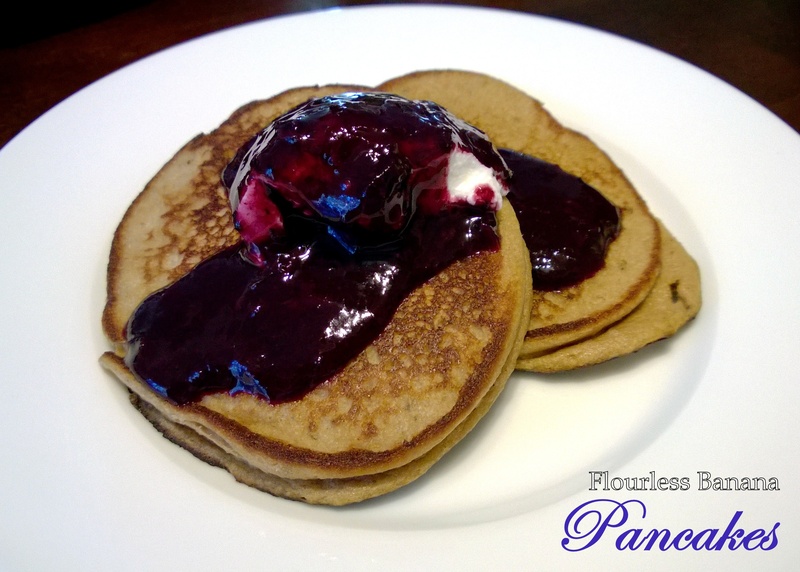 This entry was posted in Breakfast, Cakes, cupcakes & scones and tagged almond meal, banana, cake, dessert, egg, flourless pancake, FODMAP, FODMAPS, food, fructose friendly, fructose malabsorption, fruit, gluten free, healthy, high protein, home-cooked, homemade, jam, low carbohydrate, low fructose, low sugar, nuts, pancake, pikelet, preserves, sweet, vanilla, vegetarian. Bookmark the permalink.